Editors' Note: We've invited Eunny Jang, editor of PieceWork's sister publication Interweave Knits to talk about a traditional knitting technique that has been gaining in popularity. Entrelac, one of my favorite knitting techniques, is a powerful demonstration of how ingenious knitters can be. At first glance, entrelac knitting looks like strips of fabric woven over and under each other or perhaps individual squares that have been painstakingly pieced together. Take a closer look, though, and you’ll see that entrelac is actually worked all in one piece, without a single seam: instead, you work one block at a time, joining it to its surrounding blocks as you go with simple decreases. So nifty! 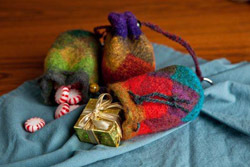 “Entrelac” is French for “interlaced,” but the oldest examples of this technique come from Scandinavia, where it was sometimes called “basketweave” or “patchwork” knitting, often around the tops of stockings. It’s a marvelously flexible technique—you can knit it flat in two colors for the traditional checkerboard look or in the round to create tubes. You can use as many colors as you dare. 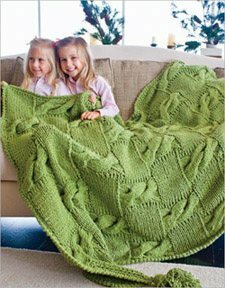 Because the stitch uses yarn in such an unusual way, it’s a great way to show off long-stripe yarns. And you can use entrelac as a sculptural tool to shape your knitting even as you adorn it: By introducing shaping into the entrelac squares and thinking carefully about where a new square should join, you can create circular sweater yokes, hats, and all kinds of three-dimensional forms. Getting started with entrelac can be a little tricky, so sit down with a cup of coffee (or a glass of wine—but just one! You’ll need all your concentration), your yarn and needles, and an adventurous spirit, and cast on. You’ll see your fabric grow stitch by stitch and block by block. Just watch out—entrelac can be addictive. For a step-by-step look at the entrelac technique, from beginner basics to shaping garments, check out Knitting Daily's new workshop, Entrelac Knitting, Basics and Beyond. I'll help you to get started and develop your entrelac skills with lace, colorwork, and other fun techniques.